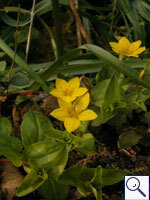 Nine species of Lysimachia are recorded in Britain. These include the native Creeping Jenny (L. nemorum), Yellow Pimpernel (L. nummularia), Tufted Loosestrife (L. thyrsiflora) and Yellow Loosestrife (L. vulgaris). Two British leaf-miners are recorded on Lysimachia. The polyphagous agromyzid Liriomyza trifolii has been recorded in quarantine in Britain (Dom Collins (pers. comm.). See also Liriomyza species in Glasshouses and/or Quarantine Interceptions. A key to the European miners recorded on Lysimachia is provided in Bladmineerders van Europa. 1b > Leaf-miner: Lower surface blotch without folds, with irregular corridor-like extensions; centre of the mine brownish. Frass dispersed. (Bladmineerders van Europa). On Lysimachia vulgaris in Britain and continental Europe. A local species, which can be abundant, found in damp areas and fens. Widespread in continental Europe.